The L15B7 is a 1.5-liter I-4 turbocharged gasoline direct-injection engine that was first introduced in the 2016 Honda Civic. The engine is a result of Honda’s downsizing strategy that involves using small displacement units in conjunction with a turbocharger to overcome the power problem. So, the 1.5L turbo engine provides fuel efficient, but at the same time decent power and torque exceeding the torque of a natural-aspirated 2.4L engine. The manufacturer already began offering the 1.5T engine for relatively heavy cars such as the Honda CR-V and the Honda Accord. Let's take a closer look at what makes the Honda 1.5l turbo engine so efficient and powerful. The engine uses an aluminum open-deck cylinder block and aluminum cylinder head. The engine block is equipped with lightweight steel connecting rods (heat-forged for higher strength) to withstand high loads. There are also new cavity-shaped pistons, which have an optimized skirt design to minimize vibration and friction and increase operating efficiency. The manufacturers applied plateau honing (grinding process) for cylinder walls to reduce friction between pistons and cylinders even more. Pistons are cooled by oil spray jets directed at the bottom of the piston. The head design includes four valves for each cylinder and DOHC (dual overhead cam) driven by the timing chain. The intake and exhaust camshafts are equipped with actuators of the VTC. Each multi-hole direct fuel injector is placed between two intake valves; the spark plug is on top in the center of a combustion chamber. The cylinder head has high tumble intake ports (tumble ratio is 1.9) that strengthen intake airflow and promote efficient fuel combustion. The 1.5T engine also has a water-cooled exhaust manifold built into the cylinder-head - exhaust-port passages cast directly into the head. The cooled exhaust gases (approximately by 100 ° C) prolong the longevity of the turbocharger components and also contribute to faster engine warm-up. The L15B7 engine has a mono/single scroll turbocharger MHI-TD03 with small-diameter turbines and electric wastegate. The small size turbo with electronic control minimizes a “turbo lag” effect and provides rapidly responds to acceleration. Boost pressure is 16.5 psi for a standard US Civic with 1.5t engine and a 10.6:1 compression ratio. To reduce the temperature of intake air compressed and heated by the turbocharger, Honda’s 1.5t engine uses a more common air-to-air intercooler. After intercooler, air goes into a plastic intake manifold. The engine speed is controlled by the electronic drive-by-wire throttle. That means there is no mechanical connection between acceleration pedal and throttle valve. The manufacturer did not apply the true Honda’s VTEC for the 1.5-liter turbo engine - there is no variable lift mechanism, only dual VTС. Only the 2.0L VTEC TURBO has i-VTEC (intelligent Variable Valve Timing and Lift Electronic Control) with the dual VTC. The 1.5-liter turbo engine for the Honda Civic Si copies the European 1.5T VTEC Turbo engine specs. It produces a 205 hp at 5,700 rpm and 192 lb-ft (260 Nm) at 2,100 rpm. The gain in power was achieved by using more performance intake camshaft and higher boost pressure - 20.3 psi. To be able to handle raised boost, this version has a lower compression ratio at 10.3 from 10.6 due to other pistons. The standard connecting rods were replaced by reinforced ones. More air needs more fuel - in this case, the Si engine was equipped with more productive fuel direct injectors. Engines for the Accord and CR-V are based on the Si engine. The CR is 10.3:1. The boost pressure the Honda CR-V is 18.5 psi; it produces 190 hp and 179 ft-lb. The boost pressure the Honda Accord is higher – 20.2 psi; power output is 192 hp and 192 ft-lb. The 1.5T engine doesn't warm up and produces enough heat while idling. This feature is a big disadvantage for a cold climate operation. The engine is so efficient and has minimal wasted heat. Many owners say it won’t produce any heat until they start driving. This issue doesn't allow the engines to fully reach operating temperature on short trips. A cold engine can develop condensation and excess fuel vapors which travels down into the crankcase where it mixes with the engine oil in the oil pan. A direct fuel injection aggravates that problem, because fuel, sprayed into the combustion chamber directly, sticks to the cylinder walls. That all lead to the most reported problems for vehicles with Honda 1.5L turbo engine - a high or rising engine oil level due to oil/gas dilution problem. The problem with diluted oil has common symptoms: gas smells inside a cabin; a higher-than-normal engine oil level; check engine light comes on; engine misfires. The manufacturer knows about that problem and already introduced a solution that consists of several service campaigns which will include software updates, oil change, a new drain plug washer, and in some cases, the replacing of the climate control unit. Carbon build up on the back side of the intake valves is a problem of all engines with direct injection there is no port injection at all. This process is exacerbated even more during short trips on a cold engine. The 1.5t engine is relatively new and still doesn’t have many consumer reports about carbon deposition, but, the other newest Honda’s DI engines started bringing problems related to carbon build up at mileage about 50-60k miles. L15BF - 148 hp (110 kW) at 5,500 rpm, 150 ft lb (203 Nm) at 1,600-5,000 rpm. It is version of the L15B7 with a 10.6:1 compression ratio for the Honda Jade RS available in Chinese market, Japanese Domestic market and Singapore. L15B9 - 179 hp (133 kW) at 5,500 rpm, 177 ft lb (240 Nm) at 1,900-5,000 rpm. 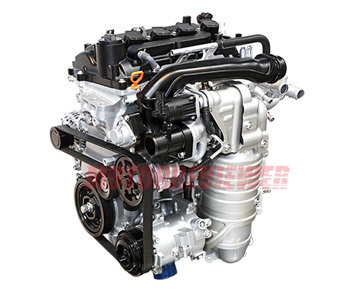 The engine is offered in Chinese Market Acura CDX.